Baby is due in a week (eeek!) and I’m back on the peanut butter train. For the first three months of my pregnancy the only thing I could stomach was colby cheese slices and crackers, and for someone who loves food as much as I do this was torture. Then out of nowhere this insatiable appetite appeared, and it has been hard fuelling this bottomless pit ever since! I got teased mercilessly at work when I had to start eating three breakfasts some mornings just to get me past morning tea. I quickly started matching my husband’s dinner plates, most of the time surpassing him. I could not believe how much food I was putting away. And most of it healthy and full of sustenance (I was always conscious about what ever I’m putting in my mouth was getting to baby too) there has been a lot of sweet treats too. I decided early on that I was not going to feel guilty about how much I was eating, and obviously growing a baby takes a lot more energy than I thought because I still don’t know how I have not gained 50 kilos by now! But now that baby’s arrival is imminent, the realisation that I can no longer hide behind the excuse of being pregnant, the cake intake is going to have to seriously be downsized. 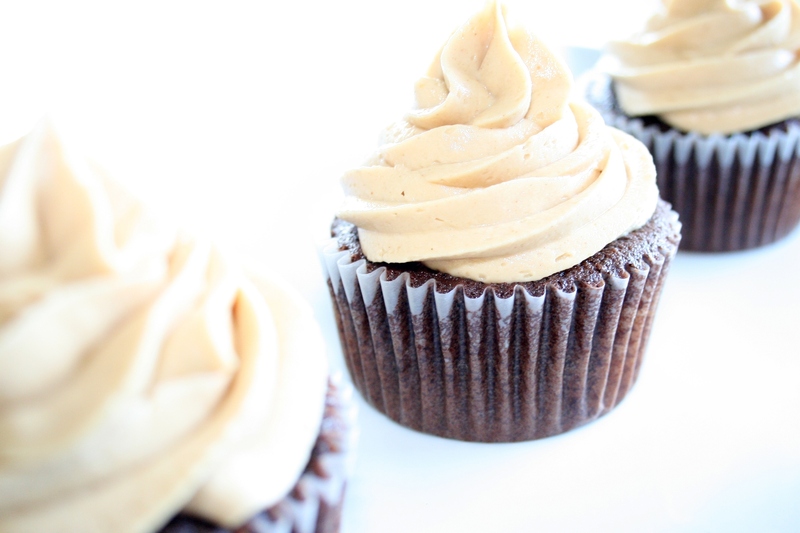 So as a last hoorah I made some chocolate cupcakes with peanut butter frosting. And I could not keep my hands off the frosting. Luckily there was some left over and I was racking my brain to think what else I could lather it on, when in the end I was happy just eating it with a spoon. The frosting is super indulgent but obviously justifiable as a once-in-a-while treat, it is light and fluffy and will easily spread on brownies or sandwiched between chocolate biscuits. 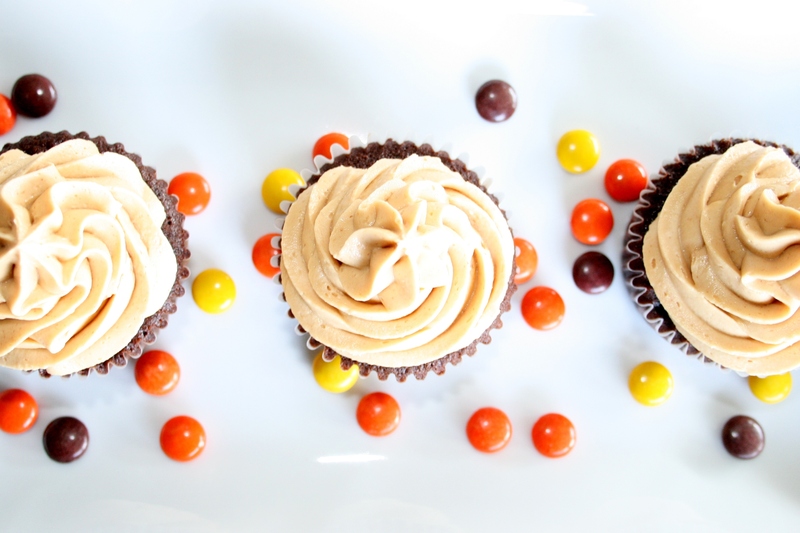 I paired it with my favourite chocolate recipe, devil’s food cupcakes. Line a muffin tray with paper cups and pour each cup two thirds full. 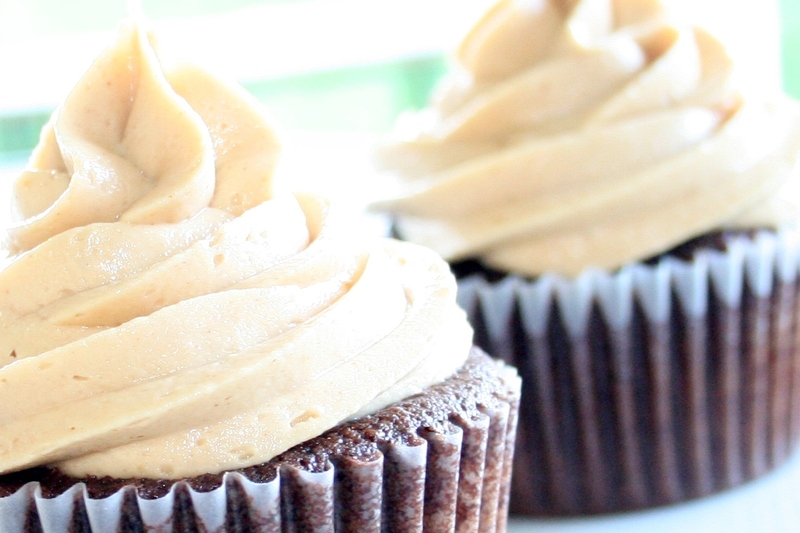 To make the peanut butter frosting: combine the icing sugar, peanut butter, softened butter and vanilla extract and beat together until light and fluffy (approximately 5 minutes). Add the cream (I used thickened cream but you could use pouring cream too) and beat for a further 2 minutes. Once the cupcakes are cooled pipe the frosting. The cupcakes will keep well for two days in an airtight container. That is so interesting, thanks for sharing Namrata 🙂 I can imagine with a diet like that you would want to eat as much as you can before baby comes! It does sound very healthy though, and is probably really good to restore your body after everything it’s been put through. I just found your blog — just want to say I love it and wishing you all the best next week!! Aw, thank you to you too!! Cupcakes look great love the photography! I love your photography, something I still learn my self!